Now that it’s been more than a month since my trip, and I am actually on a plane back to the Bay Area for Thanksgiving, I think it’s time to finish up my account of the wedding venue search. Day 3 of our search…well, Day 3 was magical, although in ways that didn’t involve venues. See, we had slated Day 3 for explorations of Oakland/Piedmont locations with The Pit’s mother…henceforth known as Irene, since that is her name. Although beautiful, neither of the places we looked at were quite the right size. 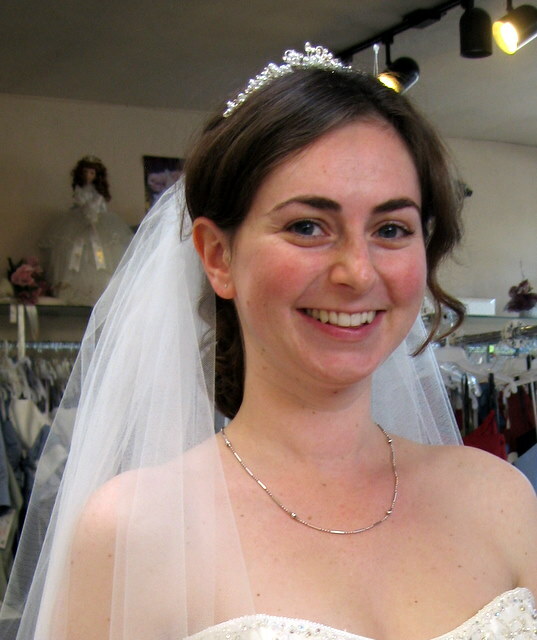 However, while driving around town Irene noticed a tiny little bridal store on Grand Avenue. We decided to stop by on the spur of the moment to see if they would show us some dresses. Although several female friends and relatives had repeatedly bugged me about going dress shopping, this was actually the first time I had ever set foot in a bridal store. The whole idea of bridal stores kind of intimidated me, if we’re going to be really honest. There was the requirement for appointments, the high pressure sales ladies, and the general feeling that I didn’t belong in any place that carried tiaras as a matter of course. I still wasn’t convinced that this was *the* dress, as there were several that I liked equally well. But I had started out the afternoon of venue searching in rumpled travel clothing, feeling frumpy and out of sorts. Two hours and 15 wedding dresses later, I couldn’t have felt more beautiful. Fairy dust is the only possible explanation. In fact, so dazzled by the experience and the choices were we all, that I couldn’t make a decision, so I shall be going back there this week to try on my favorites once more and make an actual purchase. I am very excited to run around the place half naked again. * Irene promptly tried to wipe her beauty mark off with a napkin, but luckily Vicki was more amused than offended.